"Someone stole a cake from the cake contest—who could it be? 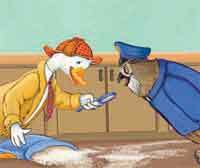 Twelve animal bakers are potential suspects but Detective Duck uses his deductive reasoning skills to “quack” the case. After all, the thief left hairs behind so the thief wasn’t a bird. Follow along as he subtracts each suspect one at a time to reveal just who the culprit was. This clever story will have children of all ages giggling at the puns and the play on words. Key phrases for educators: subtraction, deductive reasoning, animal adaptations, puns/play on words"
The Deductive Detective from Sylvan Dell Publishing is a great children's book on deductive reasoning, something that we definitely need as adults! Why not get them started sleuthing early and using logic. The Teacher Activities for this book are so fun and educational! Animal Classification, animal card games including illustrated animal cards from the story that you can print out, word finds, and more. Broken down into each area of curriculum studied. Get some great learning in this summer at home with the 21 pages of resources in addition to the ideas in the back of the book! 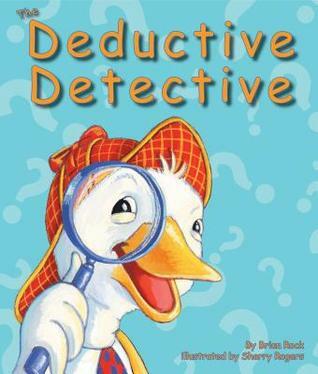 Detective Duck takes a look at each individual animal, and measures it up with the clues he finds for a funny tale of "whodunit". The human like animals are funny and your young readers will really enjoy helping Detective Duck figure out the crime. Be sure to check out other great reads for this summer from Sylvan Dell Publishing! Choose one a week to help keep their minds fresh and learning during their break from school.